War-time German documents & writings mentioning the "Final Solution"
"The 'final solution' meant the expulsion of all Jews from the German sphere of influence in Europe. After the invasion of Russia its specific meaning was the resettlement of these Jews in the East." At the beginning of the discussion Chief of the Security Police and of the SD, SS-Obergruppenführer Heydrich, reported that the Reich Marshal had appointed him delegate for the preparations for the final solution of the Jewish question in Europe and pointed out that this discussion had been called for the purpose of clarifying fundamental questions. From Document No. 2586 (E), NMT, vol. 13, 169-170. "Letter from Hermann Goering to Reinhard Heydrich, Berlin, July 31, 1941"
As supplement to the task that was entrusted to you in the decree dated January 24, 1939, namely to solve the Jewish question by emigration and evacuation in a way, which is the most favorable in connection with the conditions prevailing at the time, I herewith commission you to carry out all preparations with regard to organizational, factual, and financial viewpoints for a total solution of the Jewish question in those territories in Europe under German influence. If the competency of other central organizations is touched in this connection, these organizations are to participate. I further commission you to submit to me as soon as possible a draft showing the organizational, factual, and financial measures already taken for the execution of the intended final solution of the Jewish question. In his March 7, 1942 diary entry, Propaganda Minister Joseph Goebbels further explained the meaning of the "Final Solution"
There is also the "Schlegelberger letter"
1. The principle of the German Jewish policy after the seizure of power consisted in promoting with all means the Jewish emigration. For this purpose, in 1939, Field Marshall Göring in his capacity as Plenipotentiary for the Four Year Plan established a Reich Central Office for Jewish Emigration, and the direction was given to SS Lieutenant General Heydrich in his capacity as chief of the Security Police. The Foreign Office is represented in the committee of the Reich Central Office. The draft of a letter to this effect to the Chief of the Security Police was approved by the Reich Foreign Minister as 83/24 B in February 1939. 2. 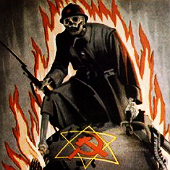 The present war gives Germany the opportunity and also the duty of solving the Jewish problem in Europe. In consideration of the favorable course of the war against France, D III proposed in July 1940 as a solution - the removal of all Jews from Europe and the demanding of the Island of Madagascar from France as a territory for the reception of the Jews. The Reich Foreign Minister has basically agreed to the beginning of the preliminary work for the deportation of the Jews from Europe. This should be done in close cooperation with the offices of the Reichsführer-SS (compare D III 200/40). The Madagascar plan was enthusiastically accepted by the RSHA, which in the opinion of the Foreign Office is the agency which alone is in the position technically and by experience to carry out a Jewish evacuation on a large scale and to guarantee the supervision of the people evacuated, the competent agency of the RSHA thereupon worked out a plan going into detail for the evacuation of the Jews to Madagascar and for their settlement there. This plan was approved by the Reichsführer-SS. SS Lieutenant General Heydrich submitted this plan directly to the Reich Foreign Minister in August 1940 (compare D III 2171). The Madagascar plan in fact had been outdated as the result of the political development. The fact that the Führer intends to evacuate all Jews from Europe was communicated to me as early as August 1940 by Ambassador Abetz after an interview with the Führer (compare D III 2298). Hence, the basic instruction of the Reich Foreign Minister, to promote the evacuation of the Jews in closest cooperation with the agencies of the Reichsführer-SS, is still in force and will therefore be observed by D III. 3. The administration of the occupied territories brought with it the problem of the treatment of Jews living in these territories. First, the military commander in France saw himself compelled as the first one to issue on September 27, 1940, a decree on the treatment of the Jews in occupied France. The decree was issued with the agreement of the German Embassy in Paris. The pertinent instruction was issued directly by the Reich Foreign Minister to Ambassador Abetz on the occasion of a verbal report. After the pattern of the Paris decree, similar decrees have been issued in the Netherlands and Belgium. As these decrees, in the same way as German laws concerning Jews, formally embrace all Jews independent of their citizenship, objections were made by foreign powers, among others protest notes by the Embassy of the United States of America, although the military commander in France through internal regulation had ordered that the Jewish measures should not be applied to the citizens of neutral countries. The Reich Foreign Minister has decided in the case of the American protests that he does not consider it right to have military regulations issued for making an exception of the American Jews. It would be a mistake to reject objections of friendly states (Spain and Hungary) and on the other hand to show weakness toward the Americans. The Reich Foreign Minister considers it necessary to make these instructions to the field commanders retroactive (compare D III 5449). In accordance with this direction, the Jewish measures have been given general application. 4. In his letter of June 24, 1940 - Pol XII 136 - SS Lieutenant General Heydrich informed the Reich Foreign Minister that the whole problem of the approximately three and a quarter million Jews in the areas under German control can no longer be solved by emigration - a territorial final solution would be necessary. In recognition of this, Reich Marshall Göring on July 31, 1941, commissioned SS Lieutenant General Heydrich to make, in conjunction with the interested German Control agencies, all necessary preparations for a total solution of the Jewish problem in the German sphere of influence in Europe (compare D III 709 secret). On the basis of this instruction, SS Lieutenant General Heydrich arranged a conference of all the interested German agencies for January 20, 1942, at which the State Secretaries were present from the other ministries and I myself from the Foreign Office. In the conference General Heydrich explained that Reich Marshall Göring's assignment to him had been made on the Führer's instruction and that the Führer instead of the emigration had now authorized the evacuation of the Jews to the East as the solution (compare page 5 of the enclosure to D III 29/42 Secret). State Secretary Weizsäcker had been informed on the conference; for the time being the Reich Foreign Minister had not been informed on the conference, because SS Lieutenant General Heydrich agreed to holding a new conference in the near future in which more details of the total solution should be discussed. This conference has never taken place due to Lieutenant General Heydrich's appointment as acting Reich Protector of Bohemia and Moravia and due to his death. In the conference on January 20, 1942, I demanded that all questions concerned with countries outside Germany must first have the agreement of the Foreign Office, a demand to which SS Lieutenant General Heydrich agreed and also has faithfully complied with, as in fact, the office of the RSHA handling Jewish matters had, from the beginning, carried out all measures in frictionless cooperation with the Foreign Office. The RSHA has in this matter proceeded indeed almost over-cautiously. 5. On the basis of the Führer's instruction mentioned under '4' (above), the evacuation of the Jews from Germany was begun. It was urged that at the same time these Jews should also be taken who were nationals of the countries which had also undertaken Jewish measures. The RSHA accordingly made an inquiry of the Foreign Office. 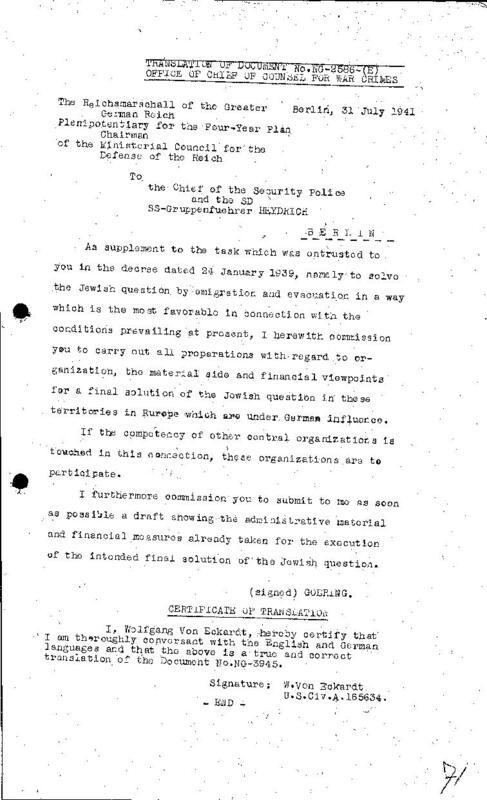 For reasons of courtesy, inquiry was made by way of the German legations in Bratislava [Slovakia], Zagreb [Croatia], and Bucharest [Romania] to the Governments there as to whether they wanted to recall their Jews from Germany in due time or to agree to their deportation to the ghettos in the East. To the issuance of this instruction, agreement was given before dispatch by the State Secretary, the Under State Secretary in Charge of the Political Division, the Director of the Division for Economic Policy and the Director of the Legal Division (compare D III 336 Secret). The German Legation in Bucharest reports with reference to D III 602 Secret, that the Romanian government would leave it to the Reich Government to deport their Jews along with the German Jews to the ghettos in the East. They are not interested in having the Romanian Jews return to Romania. The Legation in Zagreb has informed us that the Croat Government expresses gratitude for the gesture of the German Government; but it would appreciate the deportation of its Jews to the East (compare D III 624 Secret). The Legation in Bratislava reported with reference to D III 661 Secret that the Slovak Government is fundamentally in agreement with the deportation to the eastern ghettos. But the Slovak claims to the property of the Jews should not be endangered. The wire reports have also been submitted, as customary, to the Reich Foreign Minister's Bureau. On the basis of the reports of the Ministers, I have informed the RSHA with reference to D III 661 Secret that the Jews of Romanian, Croat, and Slovak nationality could also be deported; their property should be blocked. The Director of the Political Division, Section IV of the Political Division, Section IX of the Legal Division and Section IV of the Division for the Economic Policy have cosigned the document. Accordingly, the deportations of the Jews from the occupied territories was undertaken. 6. The number of Jews deported in this way to the East did not suffice to cover the labor needs there. The RSHA therefore, acting on the instruction of the Reichsführer-SS, approached the Foreign Office to ask the Slovak Government to make 20,000 young, strong Slovak Jews from Slovakia available for deportation to the East. The German Legation in Bratislava was provided, by D III 874, with proper instruction. The instruction was signed by the State Secretary, the Under State Secretary in charge of the Political Division, and Section IV of the Political Division. The Legation in Bratislava reported re D III 1002 that the Slovak Government has taken up the suggestion eagerly; the preparatory work could be begun. Following up this pleased concurrence of the Slovak Government, the Reichsführer-SS proposed that the rest of the Slovak Jews also be deported to the East and Slovakia thereby be made free of Jews. The Legation was, re D III 1559 Ang. II, provided with proper instruction. The draft of the instruction was signed by the State Secretary; after its dispatch it was submitted for their information to the bureau of the Reich Foreign Minister and the Under State Secretary in charge of the Political Division. As the Slovak Episcopacy meanwhile raised objections to the deportation of the Jews before the Slovak Government, the instruction carries the express statement that in no case must there develop internal political difficulties on account of the evacuation of the Jews in Slovakia. By the telegraphic report, re D III 2006, the Legation reported that the Slovak Government, without any German pressure, has declared itself agreeable to the deportation of all Jews and that the State President agreed personally to the deportation. The telegraphic report was submitted to the bureau of the Reich Foreign Minister. The Slovak Government had furthermore agreed that it will pay as a contribution to the cost entailed RM 500 for every evacuated Jew. In the meantime 52,000 Jews have been removed from Slovakia. Due to church influences and the corruption of individual officials 35,000 Jews have received a special legitimation. However, Minister President Tuka wants the Jewish removal continued and therefore has asked for support through diplomatic pressure by the Reich (compare D III 3865). The Ambassador is authorized to give this diplomatic help in that he may state to State President Dr. Tiso that the exclusion of the 35,000 Jews is a surprise in Germany, the more so since the cooperation of Slovakia up to now in the Jewish problem has been highly appreciated here. This instruction has been cosigned by the Under State Secretary in charge of the Political Division, and the State Secretary. 7. The Croat Government is likewise fundamentally agreeable to the removal of the Jews from Croatia. It especially considers the deportation of the four to five thousand Jews from the Italian occupied Second zone (centered around Dubrovnik and Mostar) to be important, as they represent a political burden and their elimination would serve the general pacification. The removal can of course take place only with German aid, as difficulties are to be expected from the Italian side. There have been practical examples of resistance to the Croat measures by Italian officials on behalf of well-to-do Jews. Furthermore, the Italian Chief of Staff in Mostar has said that he cannot approve the removal since all the people living in Mostar have been assured of the same treatment. Since meanwhile according to a telephone communication from Zagreb, the Croat Government has given its written approval of the proposed measure, Minister Kasche thinks it right to begin with the removal, and in fact to begin for the whole country. One could therefore take the risk of having difficulties develop in the course of the action, so far as concerns the zone occupied by Italians. A report for the Reich Foreign Minister to this effect (D III 562 Secret) has been held up by State Secretary von Weizsäcker since he considered an inquiry should first be made at the Embassy in Rome. The answer has not been received. The problem of the Italian Jews has come up in the same way in connection with the evacuation of the Jews in France. Ambassador Abetz points out in connection with the deportation in preparation from the Occupied French Territory that there was an urgent political interest to take the foreign Jews first in the evacuation measures. Since these Jews were regarded as foreign bodies, they were already especially hated and passing them over and giving them thereby a quasi privileging would cause bad feeling, the more so since among them were to be found responsible instigators of Jewish terror and sabotage acts. It was regrettable that the Axis appeared exactly in this point to pursue no uniform policy. If the evacuation of the foreign Jews were not immediately possible, the Italian Government should be for the time being asked to repatriate their Jews from France. On the Italian side, economic interests appear to play a decisive role. The safeguarding of these interests, however, is entirely possible, so that on this point there needs to be no obstacle to the planned solution. On this question of the Italian Jews in France a conference record of July 24, re D III 562 Secret, has been submitted to the Reich Foreign Minister. 8. On the occasion of a reception by the Reich Foreign Minister on November 26, 1941, the Bulgarian Foreign Minister Popoff touched on the problem of according like treatment to the Jews of European nationalities and pointed out the difficulties that the Bulgarians had in the application of their Jewish laws to Jews of foreign nationality. The Reich Foreign Minister answered that he thought this question brought up by Mr. Popoff not uninteresting. Even now he could say one thing to him, that at the end of this war all Jews would have to leave Europe. This was an unalterable decision of the Führer and also the only way to master this problem, as only a global and comprehensive solution could be applied and individual measures would not help very much. Furthermore, one should not attribute too much worth to the protests on behalf of the Jews of foreign nationality. At any rate, we would not let ourselves be taken in any further by such protests from the American side. He - the Reich Foreign Minister - would have the problem described by Mr. Popoff investigated by the Foreign Office. The Reich Foreign Minister commissioned me to undertake the investigation promised (compare D III 660g) [document NG-4669]. I should like to make reference to my basic conference memorandum of December 4, 1941, re D III 660 Secret, which I am dispatching, together with the proper files. This conference memorandum was held up by the State Secretary, because he considered a further examination by the Legal Division first necessary. In their opinion the German-Bulgarian trade and shipping pact was not in agreement with the German-Bulgarian arrangements proposed by me. I therefore notified the German Legation in Sofia, re D III 497 Secret, under the date of June 19, in reference to the suggestion of the Bulgarian Foreign Minister Popoff at his reception to contact the Bulgarian Government and find out whether it was prepared to come to an agreement in the Jewish problem that there should be no rights from the trade and shipping pact given effect in favor of the Jews in the promise of reciprocality. If the question is put from the Bulgarian side as to whether Germany is ready to deport Jews from Bulgaria to the East, the question should be answered in the affirmative, but in respect to the time of the departing should be answered evasively. This decree was cosigned by the State Secretary, the Under State Secretary, the Director of the Political Division, the Director of the Division for Economic Policy, Section IV of the Political Division, Section IV of the Division for Economic Policy, and also by Ribbentrop. The Legation exchanged notes with the Bulgarian Government and reported that the Bulgarian Government is fundamentally prepared in the problem of the evacuation to sign an agreement with us. Thereby the basis is given to include the Bulgarian Jews in the Jewish measures. (D III 559 Secret and 569 Secret). 9. The Hungarian Government has not yet been approached with respect to the Jewish removal, because the status of the Hungarian legislation up to the present does not promise a sufficient success. 10. In accordance with the agreement of the Romanian Government mentioned under '8' the evacuation of the Romanian Jews from Germany and the occupied territories was begun, whereupon various Romanian consulates and the Romanian Minister in Berlin, who had no instructions from their Government, intervened. Ambassador von Killinger was therefore asked for clarification. The Legation seems to have made use of the Jewish advisor assigned to it, Richter, for this purpose. He is a person to whom the Romanian Government confirmed its earlier agreement to the inclusion of the Romanian Jews in the German measures and to whom the Deputy Ministry President Mihai Antonescu informed of the request of the Marshall that the German agencies should also carry out the removal from Romania itself and should be then immediately with the transport of the Jews from the areas Arad, Timisoara and Turda. For details may I refer to my conference memorandum of August 17 as D III 649. 11. At the request of the governments concerned, the legations in Bratislava, Zagreb and Bucharest have been assigned advisors for Jewish affairs. They have been made available at the request of the Foreign Office by the RSHA. Their assignment is for a limited time. It ends as soon as the Jewish problem in the country concerned can be regarded as solved in the German sense. Originally it was regarded as solved as soon as the country concerned has issued Jewish laws similar to the German ones. Accordingly Richter was recalled from Romania last year by the RSHA. At the urgent request of the legation in Bucharest, Richter was again assigned to the legation despite the objection of the RSHA. This was done with the express intention of having him remain there until the actual final solution in Romania (D III 1703 Secret and 1893 Secret). Since all negotiations with the Romanian Government went through the Foreign Office, the report of SS First Lieutenant Richter submitted by the Reichsführer-SS should be considered only as an internal work report to the RSHA. The unusual procedure of having the confirmation of a final conference in the handwriting of the Deputy Minister President was sharply objected to immediately through the directive of the 17th of this month; the official handling of the affair must be carried out immediately. The files have been submitted there already under D III 659 Secret. The intended deportations are a further step forward on the way of the total solution and are in respect to other countries (Hungary) very important. The deportation to the Government General is a temporary measure. The Jews will be moved on further to the occupied Eastern Territories as soon as the technical conditions for it are given. I therefore request approval for the continuation of the negotiations and measures under these terms and according to the arrangement made. Re: War-time German documents & writings mentioning the "Final Solution"
Der Krieg gegen die Sowjetunion hat inzwischen die Möglichkeit gegeben, andere Territorien für die Endlösung zur Verfügung zu stellen. Demgemäß hat der Führer entschieden, daß die Juden nicht nach Madagaskar, sondern nach dem Osten abgeschoben werden sollen. Madagaskar braucht mithin nicht mehr für die Endlösung vorgesehen zu werden. SOURCE: PS-2233, IMT, VoL XXIX. H. Monneray, La Persécution des Juifs dans les pays de l'Est présentée d'Nuremberg (The Persecution of the Jews in the Eastern Countries Presented at Nuremberg), Paris, 1949, p. 202. It is some time ago that the Reichsmarschall charged the Reichsführer-SS and chief of the German police with preparing measures appropriate to assuring the final solution of the Jewish problem in Europe. The Reichsführer-SS has charged the Chief of the Security Police and the SD with the execution of that task. The latter has, first of an, expedited, by special measures, the legal emigration of the Jews to overseas countries. When the war made overseas emigration impossible he made preparations for the progressive clearance of the Reich territory of its Jews by their evacuation to the east. SOURCE: document NG-4583; Finanzierung der Massnahmen zur Lösung der Judenfrage: Memorandum des Reichsfinanzministeriums, Abt. I, Gruppe: Haushalt- und Kassenwesen. For approx. 2000 years, a so-far unsuccessful battle has been waged against Judaism. Only since 1933 have we started to find ways and means in order to enable a complete separation of Judaism from the German masses. The repulsion of Jews from the individual spheres of living of the German people. The laws issued by the lawmakers are hereby to be the basis, which guarantees that future generations will also be protected from a possible new overflooding by the enemy. The attempt to completely drive out the enemy from the area of the Reich. In view of the only very limited living space [Lebensraum] at the disposal of the German people it was hoped this problem could be solved in the main by speeding up the Jewish emigration. Since the outbreak of war in 1939 these possibilities of emigration decreased to an ever greater extent. On the other hand, in addition to the living space [Lebensraum] of the German people, their economic space [Wirtschaftsraum] grew steadily, so that in view of the large numbers of Jews residing in these territories a complete repulsion of the Jews by emigration is no longer possible. Since even our next generation will not be so close to this problem and will no longer see it clearly enough on the basis of past experiences and since this matter which has now started rolling demands clearing up, the whole problem must still be solved by the present generation. 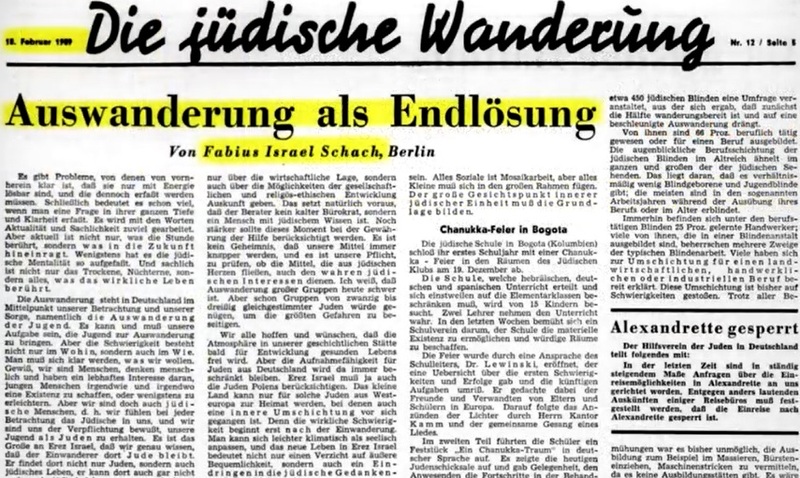 A complete removal or withdrawal of the millions of Jews residing in the European economic space [Wirtschaftsraum] is therefore an urgent need in the fight for the security of existence of the German people. Starting with the territory of the Reich and proceeding to the remaining European countries included in the final solution, the Jews are currently being deported to large camps which have already been established or which are to be established in the East, where they will either be used for work or else transported still farther to the East. Lamprecht I made some very good quotes and links to quotes in a previous post last week on the very subject of the use of the words Final Solution. They all came out of my copy of the book Founding Myths of Modern Israel by Roger Garoudy. borjastick wrote: In pre war Germany the jews themselves admitted there was a jewish problem and it needed a solution. I am reading various books this morning trying to find the exact quotes but will weigh in here with other support quotes etc. All taken from Myths of the Twentieth Century by Roger Garoudy, original source shown below each. The 'final solution' was often used in conjunction with the word 'territorial' but it would appear the word 'territorial' is dropped very often. Goring's protest of the English translation of the German word 'Gesamtlosung' (complete solution) as 'final solution' (Endlosung, led Justice Robert Jackson to acknowledge the false translation and restore the true meaning. Quite clearly in much of the use of the phrase 'final solution' they were talking of a territorial solution to the jewish problem. The problem being that they, the jews, would not leave steadily on their own and needed to be re-located. The war in Russia, leading to more available territory for this final solution being possible. Dear Party Comrade von Ribbentrop! In his capacity as Commissioner for the Four Year Plan, the Field Marshall General commissioned myself in January 1939 with implementing Jewish emigration from the whole Reich territory. Despite difficulties, in the following period it proved possible to successfully continue with Jewish emigration, even during the war. Since my office took responsibility for this task on 1 January 1939, over 200,000 Jews have emigrated from the Reich territory until now. The overall problem–there are already around 3¼ million Jews in the territories now standing today under German sovereignty – can no longer be solved through emigration however. A territorial final solution is therefore necessary. May I request that I be allowed to participate in any forthcoming discussions concerned with the final solution of the Jewish question should any be planned. Die von der Sicherheitspolizei und dem SD getroffenen Maßnahmen haben auch in Weißruthenien auf dem Gebiet der Judenfrage grundlegenden Wandel zu schaffen. Um die Juden unabhängig von später noch zu treffenden Maßnahmen zunächst unter eine wirksame Kontrolle zu bringen, wurden Juden-Ältestenräte eingesetzt, die der Sicherheitspolizei und dem SD für die Haltung ihrer Rassegenossen verantwortlich sind. Darüber hinaus wurde mit der Registrierung der Juden und ihrem Zusammenschluß in Ghettos begonnen. Schließlich sind die Juden durch eine auf Brust und Rücken zu tragendes gelbes Abzeichen nach Art des im Reichsgebiet eingeführten Judensterns gekennzeichnet worden. Um das Arbeitspotential der Juden auszuwerten, werden sie allgemein zum geschlossenen Arbeitseinsatz und zu Aufräumungsarbeiten herangezogen. Mit diesen Maßnahmen sind die Grundlagen für die später beabsichtigte Endlösung der europäischen Judenfrage auch für das weißruthenische Gebiet geschaffen worden. The measures taken by the Security Police and the SD also have to create fundamental changes in White Russia in the field of the Jewish question. In order to bring the Jews under effective control, independent of measures to be taken later, Jewish Elders' Councils were appointed, who are responsible to the Security Police and the SD for the attitude of their racial comrades. In addition, the registration of Jews and their affiliation in ghettos began. Finally, the Jews were marked by a yellow badge to be worn on the chest and back in the manner of the Jewish star imported into the Reich territory. In order to evaluate the work potential of the Jews, they are generally used for closed work and for cleanup work. With these measures, the foundations for the later intended final solution of the European Jewish question were also created for the territory of Byelorussia. Source: »Meldungen aus den besetzten Ostgebieten Nr. 9«, Berlin, den 26. Juni 1942. RGVA, 500-1-755, S. 190. "Reports from the Occupied Eastern Territories No. 9", Berlin, June 26, 1942. RGVA, 500-1-755, p. 190. 1. 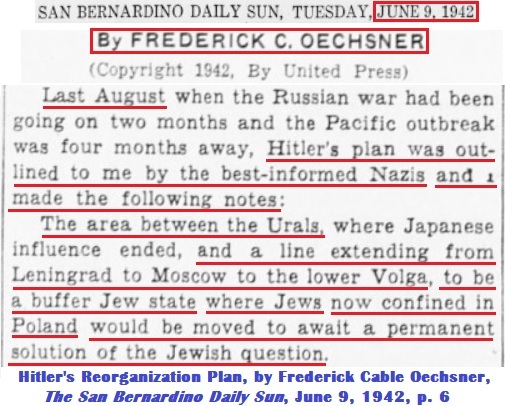 The name is spelled "Rademacher" not "Redemacher"
- In April 1943, Richard Korherr, Inspector for Statistics at the office of the Reichsführer SS, wrote the Korherr Report, which had the title "The Final Solution to the European Jewish Question" and makes no mention at all of gassing or extermination. 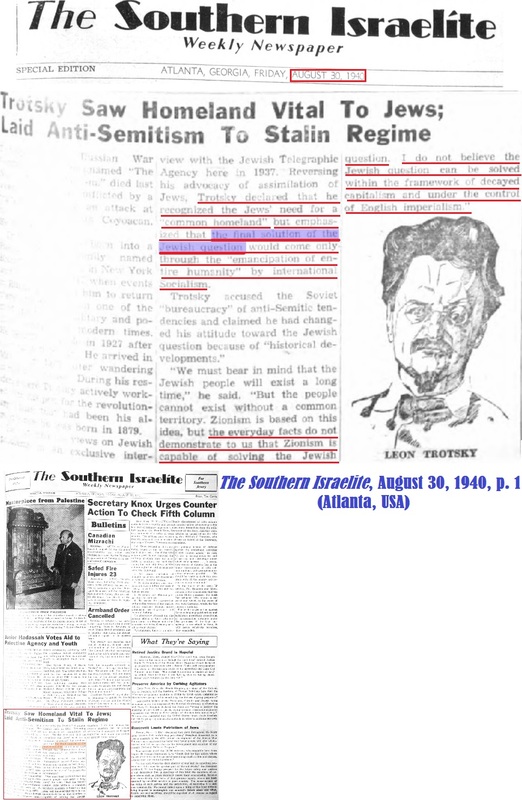 In fact, Korherr himself in a letter to Der Spiegel (see in above link) denied that "Special treatment" meant extermination, and claimed that Jews were not being exterminated but "settled in the District of Lublin." 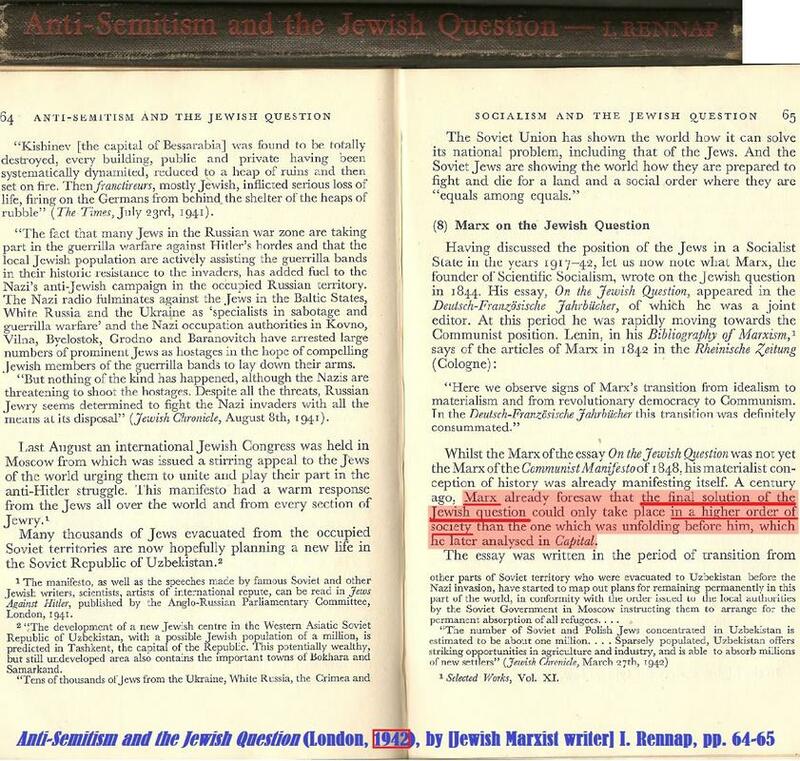 - On Oct. 17, 1941, Martin Luther, the head of the Germany department in the Foreign Office, composed a document which discusses "comprehensive measures relating to a Final Solution of the Jewish Question after the end of the War." - September 1942: In the so-called "Green Map" for the "Administration of the Economy in the Occupied Eastern Regions," it is stated that "After the War, the Jewish question will be solved overall throughout Europe," which is why until then everything would merely be "partial measures." It admonished that "thuggish measures" against Jews would be "unworthy of Germans and must be avoided by all means." - On 5 September 1942, Horst Ahnert of the Paris security police wrote that in conjunction with the "final solution to the Jewish question" that the "deportation of Jews for purpose of labor" was about to begin. I would also like to point out in regards to the Maedel note (document NG-4583) from a previous post (above), I have seen it cited for the date 14 November 1942 (which is what I have written) as well as 14 December 1942. Most recently it is cited as 14 December, so I believe that to be the correct date. The document itself I can not find online. 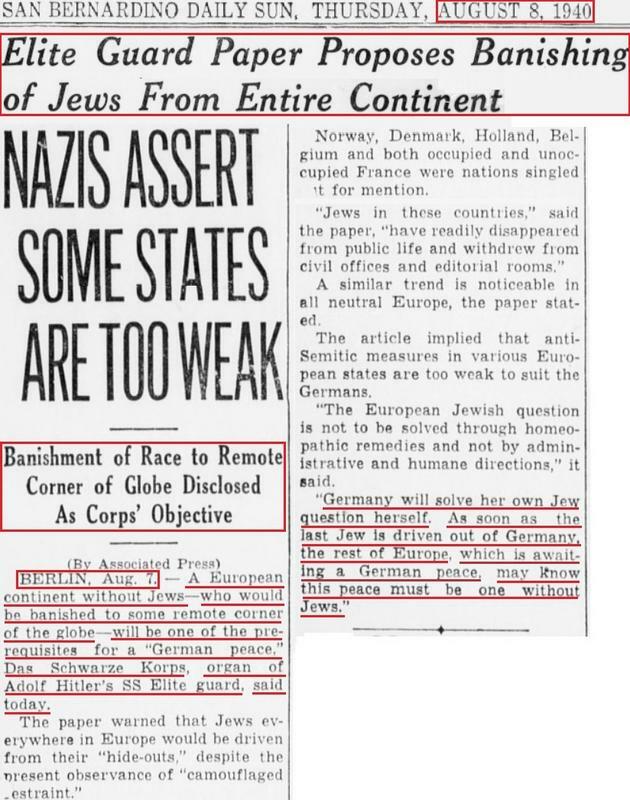 Some interesting news articles mentioning the "Final Solution"
The banishing of all Jews in Europe to some remote corner of the globe will be one of the paramount clauses of a “German peace,” Das Schwarze Korps, organ of the Nazi Elite Guard, asserted today. 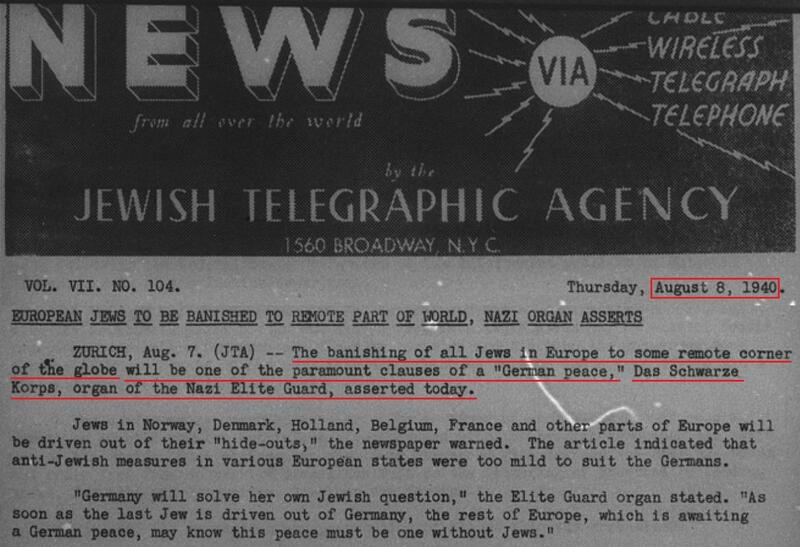 Jews in Norway, Denmark, Holland, Belgium, France and other parts of Europe will be driven out of their “hide-outs,” the newspaper warned. The article indicated that anti-Jewish measures in various European states were too mild to suit the Germans. Frederick Cable Oechesner was an American journalist that reported from Germany between 1929-42, chronicling the rise of National Socialism. He headed the Berlin bureau of what was then the United Press, overseeing correspondents including Richard Helms, who would serve as director of the C.I.A. from 1965 to 1973. The area between the Urals, where Japanese influence ended, and a line extending from Leningrad to Moscow to the lower Volga, to be a buffer Jew state where Jews now confined in Poland would be moved to await a permanent solution of the Jewish question.